For January 2019 there are 3 homes for sale in Schooner Oaks in Stuart, FL. These condos are listed for sale with prices from $259,900 up to $269,900. This is an average list price of $264,933 or $136.53 per sq. ft. of living area. In the past 12 months, 6 Schooner Oaks homes have sold. The sales prices ranged from $200,000 up to $286,000. This works out to an average sales price of $245,417 which equals $135.92 per sq. ft. of living area. These homes went under contract in an average of 53 days and sold for 93% of list price. 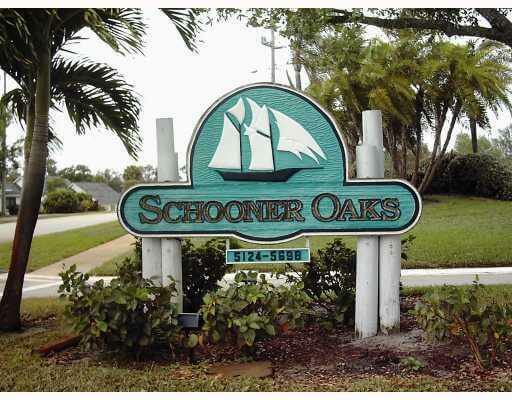 The Schooner Oaks community of Rocky Point in Stuart FL is a townhouse style complex under condo association rules. There are 86 units of varying sizes that were built from 1985 till 1997. These townhouses vary from the largest one with 4 bedrooms and 4 bathrooms and 2,140 sq. ft. of living area down to 2 bedroom, 2 bath condos with around 1,400 sq. ft. of living area. Most units come with an attached single car garage. Residents enjoy the use of a clubhouse with billiards, fitness room, heated pool, spa and tennis courts. There’s a waterfront gazebo with a day dock and fishing pier off the Intracoastal Waterway with views toward the Saint Lucie Inlet of the Atlantic Ocean. This is a pet friendly community allowing for up to two large pets. Rentals are also allowed and there are some vehicle restrictions. The current HOA fees are $570 per month. These fees cover Assessment Fee, Cable, Common Areas, Fire/Liability Insur, Grounds / Plants, Insurance-Bldg, Insurance-Other, Janitor, Lawn Care, Legal/Accounting, Maintenance – Repair, Maintenance Exterior, Management Fees, Manager, Pest Control, Pool Service, Reserve Funds, Roof Maintenance and Trash Removal.